Working with a low budget is something all film makers have to endure at one point in their career. 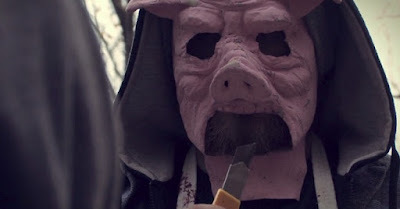 Horror is one of the most forgiving genres, allowing up and coming auteurs to remain in control of their projects while using very little money and gaining decent returns. Many times indie films revel in their humble origins, relaying over the top sequences of gore or wandering too far into comical territory to still be considered scary. Torin Langen's outstanding feature debut, 3 Dead Trick or Treaters is a remarkable anthology piece that thankfully breaks with tradition, weaving together four short films and a wraparound tale that not only celebrate Spartan independent cinema, but also present an unholy marriage of silent era theatrics and modern, socially aware entertainment. The central narrative involves a paperboy who finds three graves, each of which contain a short story scribbled on notebook paper. 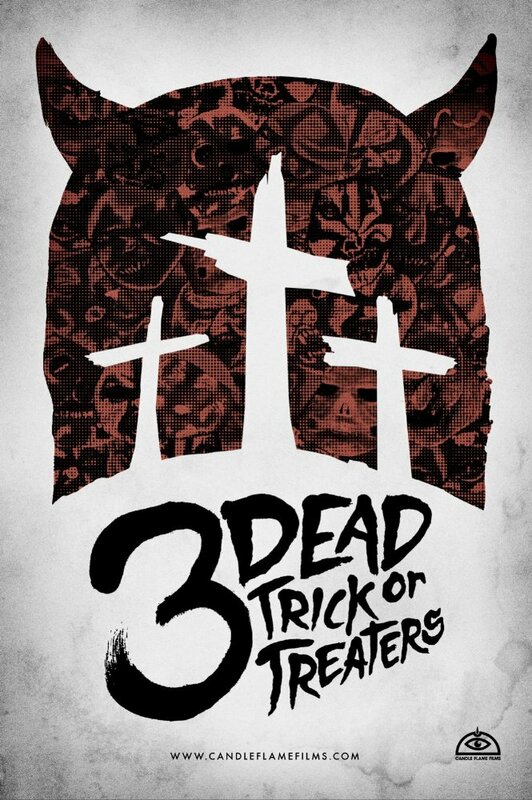 One tale involves an unspeakable Halloween ritual, another explores religious fanaticism, the third presents an uncomfortable allegory for the plight of the needy, and the fourth tale, revealed in the final act, involves a devious pair of police officers who run an unconventional courier service. Each segment was written by Langen, with the second, Malleus Maleficarum being the best of the bunch. It is important to remember that there is no dialogue, only a brooding score by Stephen Schooley and Langen's adroit editing, fusing together the stories and the wraparound with a devious sense of harmonics. Langen's cinematography has a dreamlike quality, with characters moving in trance like patterns through rustic forests and abandoned houses. The complete lack of dialogue heightens the mood, elevating the simplistic presentation through uncomfortable close ups and quick cuts that let the viewer's mind do the lion's share of the work. It is one of the most important blessings of a low budget horror film: Keeping the violence off the screen and in the audience's subconscious, and Langen does this extremely well, making each of the stories’ profane mysteries and their appalling revelations linger long after the denouement. 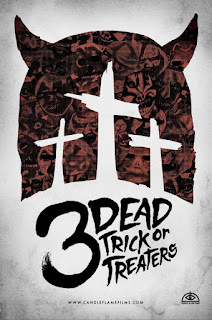 Coming soon to digital streaming, 3 Dead Trick or Treaters is a barebones, but extremely well-constructed anthology horror experience. Using every second of its 75 minute running time to stay within the confines of its creepy universe, this is a fun, and at times, disquieting collection of morality tales that is light on the violence while plunging into the uncomfortable truths of polite society. Consumerism, the power of conviction, totemic violence, obsession with fame, and indigence are all explored in Lagen's silent madhouse, yielding a wonderfully composed picture of American dread.